The Stuttgart Reds are admittedly still quite young season in the 1. Bundesliga Baseball one of the surprise teams. In the off season pretty quiet, they are after two days with a score of 3-1 on the shared first place in the South. One reason is new signing Gary Michael Owens, who will be honored on Match day as Player of the Week. Gary Michael Owens hit two homeruns in game two on Saturday (Photo: Iris Drobny, drobny.photography)day as Player of the Week. With 9: 3 and 5: 2, the Reds prevailed against their ambitious München-Haar Disciples on Saturday. An important Sweep the play-off race. Owens, the game in one of two hits, a run, an RBI and two stolen base succeeded, had in the second game much of this success. His two homers and three RBI in the first and fifth game portion provided for the decision in the victory. 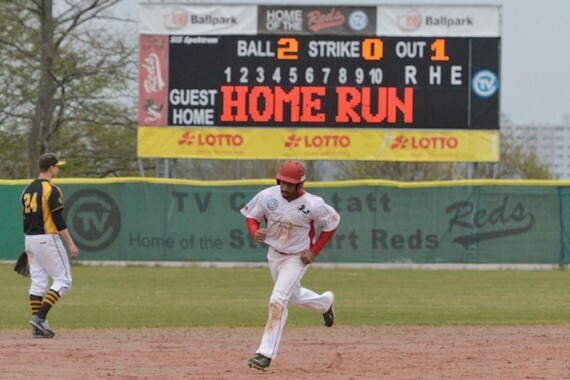 Owens joined in winter by the Bad Homburg Hornets to the Stuttgart and is there to help bridge the gap of Thomas de Wolf to close, which provided the offensive with his home runs in recent years for the Power. After two matchdays Owens is on the right track. In each of the first four games he scored at least one run and already collected four extra-base hits. This coming weekend is waiting with the guest performance at the Mannheim Tornados the next positioning in the race for the play-off places.